The modern city of Athens as the heart of finance, politics, commerce, arts and culture in the country, is a busy metropolis offering a wide range of high class accommodation options, having some of the best and most luxurious hotels and resorts in the world situated at the heart of the city as well as at the Athenian Riviera to offer high standard accommodation and conference facilities, a wide selection of fine dining, amusement and entertainment. 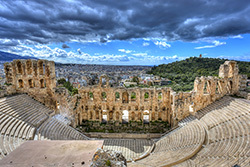 Apart from the world renowned archaeological interest of the city, a visit in Athens promises a unique cultural experience with numerous cultural events taking place throughout the year, a variety of sports facilities while boasting a picturesque city center, several museums, glorious parks and beaches. The host city of the Olympic Games 2004, with its modern infrastructures is an exciting worldly known capital that attacks the senses and stirs the spirit as only the cradle of Western Civilization can. Athens, being the capital of Greece and a major hub in the Aegean, Balkan and East Mediterranean regions can be easily accessed by air as it connects with a large number of European carriers directly. Low fare as well as regular flights land daily, especially during the summer period at the new Athenian International Airport, Eleftherios Venizelos. The airport opened in 2001 as part of the infrastructure improvements in preparation for the Olympics 2004 and is allegedly now one of the most attractive and efficient major European airports. Once reaching the airport, it is easy for the visitor to get to the city centre of Athens by metro, regular bus services, or taxi. Other than flying to Athens which is the most popular mean of transportation also due to the morphology of the country, depending on the departure's location, visitors can approach the city by sea, train or buses. 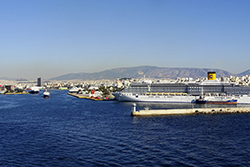 Athens does not connect to other neighbouring countries by sea unless visitors approach the city with cruise ships. 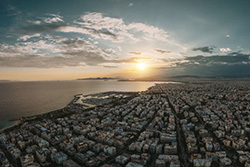 However, the port of Piraeus acts as the marine gateway to Athens, and is served by many ferries that connect the city with all the islands in the Aegean Sea. On the other hand, the Greek railway system is not an advanced one, having two major lines that connect Athens with Peloponnese on the south and the second major city situated on the northern part of the country, Thessaloniki and Istanbul. Finally busses connect the city with adjacent countries such as Turkey, Bulgaria, Serbia, Fyrom and Albania. 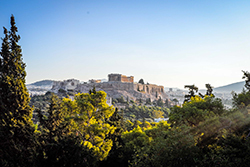 Alike any European city, the center of Athens can be easily explored on foot in order to discover its hidden treasures to appreciate its contradictory, thus charming, character. As the public transportation hub of the whole city, Syntagma Square is a starting point for the Athenian visitor. With the view of the Greek Parliament, a gigantic building to previously host the royal palace during the Ottoman Empire, Syntagma is the nowadays thriving heart of the modern city of Athens. Every hour, tourists gather at the bottom of the square, right in front of the entrance of the parliament building to photograph the unique changing of the guard. Peripherally to the square, the numerous cafes, the up scale shopping centers as well as some of the most renowned and historical Athenian luxury hotels, give an impressive look of the city especially under the evening lights. Within a short walk from the square, is the Academy of Athens, the national academy of the country, built as a tribute to the Academy of Plato. The magnificent complex of buildings along with the imposing statues of ancient Greek gods and philosophers, honors the tradition of knowledge, philosophy and study in the country, making it one of the most photographed landmark of the city. As an extension of the Parliament, visitors can find an escape to greenery at the National Garden. Although situated on the heart of the busy city center, one can relax and enjoy tranquility on the gardens inspired by Queen Amalia's and designed for recreational activities of the royal family. With ancient ruins to ogle at every turn, nowadays the garden hosts a zoo, a botanical museum, a playground and small lakes with geese and swans surrounded by lavish green. Between the National Garden and the Temple of Olympian Zeus, is Zappeion Megaron Hall of Athens, one of the first buildings in Europe specifically designed for exhibitions and conferences built to serve the needs of the revival of the first modern Olympic Games in 1896, also used for the 2004 Games. For the same purpose the astonishing Panathenian stadium located right below Zappeion, was also refurbished. The most recognizable landmark of Greece and one of the most famous sights around the world listed among the UNESCO World Heritage sites, Acropolis a religious complex of twenty-one vital monuments, is the ultimate must visit destination of the city. Temple of Parthenon, built during the acne of the Golden Age of Athenian democracy, to worship Athena the ancient goddess of knowledge, is an awe-inspiring temple in Doric style. The Temple of Nike, the Erechtheion. Perched, the Herodion Theater, still hosting cultural events, are only some of the historical monuments situated on the Acropolis Hill, a site of eternal archaeological excavation, with limitless treasure trove of remarkable relics. 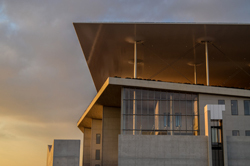 The newly constructed Acropolis Museum hosts rare sculptures from the Classical Period and artifacts that cover the Bronze Age to Byzantine Greece. A visit at the Philopappou Hill, almost at eye level with the Acropolis, is a great chance for the visitors to have a breathtaking while romantic during sunset, view of the Parthenon as well as the city of Athens, from the Saronic Gulf to the Argolic Hills. Since Greece and archaeology go hand in hand, the National Archeological Museum is the absolute best of what Greece has to offer in terms archaeological findings. The museum which is homed at a magnificent neoclassic 1889 building at the center of the city, is one of the largest and most popular museums in the world. Its exhibits are some of the most significant sculptural and architectural specimens of the Athenian heritage and history; Kouros statues, Cycladic idols, the golden mask of Agamemnon as well as ancient relics, artifacts, monuments, documents, jewellery, pottery, utensils and weapons from the ancient Egypt as well as frescoes from Santorini's volcanic island are only some of the thousand exhibits of the museum. Visitors of Athens and admirers of the Greek civilization can familiarize themselves to the classical beauty of Greece and the history of Athens, otherwise remaining unknown without a visit to the National Archaeological Museum. Just below the Acropolis are the remains of the ancient Agora, the very centre of social, civic, commercial, administrative and political activities in Athens during the Classical Period of Greece, where Socrates and Plato carried philosophical discussions. It is the best remaining sight of its kind around the world with as many as twenty vital inherent monuments including among others, the Temple of Ares and Hephestos, Altar of Zeus Agoraios, the Tholos in the Agora and Odeon of Agrippa. 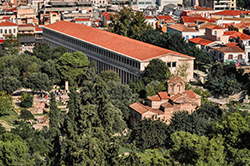 Along the ancient agora is a museum to house numerous archaeological finds from the 5,000 year old Athenian history providing valuable info for those willing to see and learn. 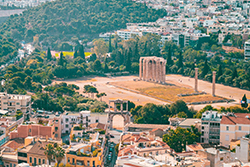 Close to the Syntagma Square, the eye-catching sight of the Temple of Olympian Zeus cannot be missed while passing by it. These striking millennial old architectural ruins, once grander than the Parthenon itself, speak of the Classical Period. The temple was built to house an altar for an ivory gold statue of the god Zeus, in a construction of 104 Corinthian columns made of Pentelic marble, 17 meters in height each. Nowadays only a few of them are standing tall still, bearing a testimony to the vastness of the sanctuary and the history of the city. For those wishing to leave the crowds of the city and visit a world-renowned archaeological site along with a dip on clear blue waters with a magnificent ride through the Athenian Riviera, at Vouliagmeni and Lagonissi to house some of the most luxurious resorts in the world, Sounio is the place to be. Located 69 km from Athens, Cape Sounio is the southernmost tip of the Attica peninsula where the ancient temple of Poseidon surrounded on three sides by the sea, offers stellar Aegean Sea photo ops, especially during the sunset with an excellent view of the Aegean Sea, making it a sought-after spectacle. Other than the major archaeological sights and monuments, Athens being the capital of Greece and the center of its the civilization, offers a number of options in terms of museums that give the visitor an insight on the history and traditions of the city. 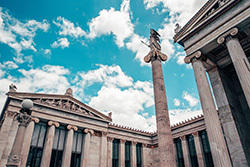 Close to the Syntagma Square is the Museum of Cycladic Art, exhibiting statutes and artifacts of that period while the War Museum presents images of Greek history from antiquity to the present as an honor to all those who fought for the freedom of the country through the years. The Byzantine museum offers a rare glimpses of the Byzantine as well as post-Byzantine sculpture, paintings, manuscripts, mosaics, lithographs, woodcarvings, coins, bronze engravings and prints. A museum of Athens where the Greek history of 8,000 years seems to be alive is the Benaki Museum to host an amazing collection of artifacts from the prehistorical era to the modern period of Greece, as well as Childhood and Toy Department storing 15,000 historic games from across the globe, the Chinese Art Department exhibiting 4,000 year old ceramics and the Coptic Art Department displaying rare Egyptian textiles are all worth the visit. Athens can be a sports fan paradise from the most to the least expected ones with fine sports facilities and infrastructures. Sea related sports such as scuba diving, wind surfing, water skiing, or beach volley can be practiced at the large cosmic beaches or within luxury hotels' premises. The national park of Mount Parnitha is ideal for trekking, while the Glyfada golf course is one of the best equipped in the country. During the winter, ice skating rinks are available for the public either in central squares and hotels or private amusement parks. Last but not least, beaches can be a part of a visitor's stay in Athens. There are several beaches available with clean waters, a must for a refreshing dip during the hot summer. Some of them being private and therefore having an entrance fee, while others less crowded and more deserted are scattered within the coast line of Attica. Having the city as a base, Athens is ideal for island hoppers who can reach some lovely Greek within a few hours boat trip from the port of Piraeus. Greek cooking style is a typical example of the Mediterranean cuisine, characterized by four fundamental elements; extra virgin olive oil, high quality fresh ingredients, local herbs and spices, all combined with simplicity in order to enhance the flavors. Due to the mild climate as well as the morphology of the ground, Greece is a producer of various fruits and vegetable, from apples and chestnuts, to avocados along with Greek tomato, cabbage, carrot, onion, parsley and garlic, grapes, apricots, peaches, cherries, melons, watermelons, etc. Widely spread breeding of free range sheep give an incomparable taste in its flavour along with the world famous diary products such as feta cheese and Greek yogurt. In this capital city, all kinds of gastronomic options are widely available; from fine dining and high end gastronomy with Michelin starred restaurants, a large variety of international tastes, fresh fish and sea food, to street food with widely consumed souvlakis.